It is always a pleasure to see Di van Niekerk’s wonderful work. Find new ideas and techniques that appeal to embroiderers and quilters alike. 17 panels introduce you to the techniques. There is a stitch gallery too. Each of the 60 design elements are shown with clear step-by-step photographs. Embroider the whole sampler as one, or choose motifs separately. Suitable for beginners upwards. Everything you need to know to create beautiful embroidered panels in a beautifully illustrated book. 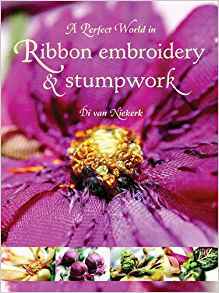 Includes instructions to embroider fantastic flowers and creatures such as dragonflies, bees and birds.